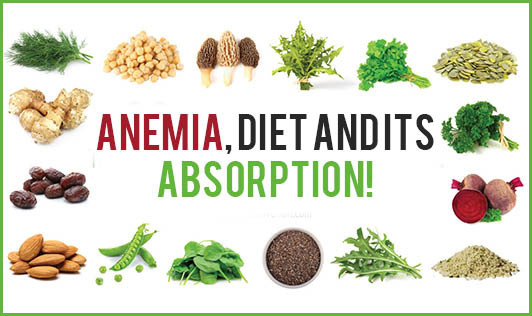 Anemia, Diet and its Absorption! Anemia is a disorder in the level of iron in the blood. It is a very important constituent of the red blood corpuscles (RBC) that help carry oxygen and nutrients to all the parts of the body. If the iron levels are less in the body, it can lead to exhaustion, hair fall, pale skin, abnormal sleep and bad health status. Consuming iron rich foods and taking iron supplements are the two best known methods to keep anemia at bay. But the absorption of iron in the body plays a major role in determining how well the supplements and the diet work. 1. Though your diet is filled with iron rich foods, cooking methods can reduce or destroy the iron in the food, hence, affecting the absorption capacity. 2. Some drugs can bind to the iron in food and prevent its absorption. Tetracyclines and quinolones chelate (bind) with iron so that neither the antibiotic nor the iron is absorbed. 3. Phytate (found in wholegrain cereals, nuts, seeds and legumes), polyphenols (found in tea and coffee) and calcium (in dairy products) impair iron absorption. However, iron absorption can be increased in a diet rich in fish, red meat and white meat. Contact your dietitian to know different cooking methods to prevent iron loss from foods and get a personalized diet prescription today.